Facebook launched its new "Ask Our Chief Privacy Officer" option Monday to try and alleviate user concerns with the social network's privacy policies. Users can now go to Facebook's privacy page and find a drop down option for "Ask Erin," where they will find a form to submit any and all questions. 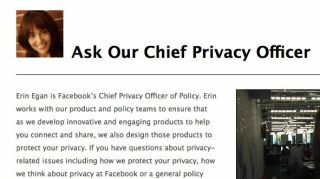 All questions will be passed along to to Erin Eagan, Facebook's chief privacy officer, who will answer a selection of questions each month. The "Ask Erin" option replaces Facebook's previous system whereby users could vote for or against on any new privacy policies before they were enacted. The last vote in December proposed removing the voting policy altogether, and failed to reach the participation threshold for a binding user vote despite 88 percent of those who did vote opposing the change. The new system arguably gives users significantly less of a voice in Facebook's privacy policies, now only letting them ask questions about policies instead of the possibility of overturning what they oppose. There is also no guarantee that a question will be answered, with Facebook encouraging users to read the Facebook Help Center for possible answers "since Erin will not be able to respond to every question." Facebook's last round of privacy updates made it easier to control who sees what you post, but will not allow a profile to be removed from searches entirely. In Eagan's first pos,t she answered some of the more common questions, such as if Facebook sells private data to advertisers. The answer, of course, was no, with an explanation that advertisers give Facebook demographics they want to reach and Facebook uses personal data to push ads to users in that demographic. None of the personal data is actually seen by the advertiser though. If the first Ask Our CPO post is any indication, users can expect three policy questions answered each month. The answers appear to be fairly transparent, which makes them a useful resource for those curious about Facebook privacy policies, but that usefulness will also depend on the quality of the questions going forward.